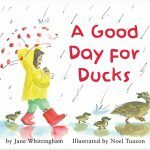 Rain is falling, and these siblings know just how to enjoy it: raincoats, rubber boots, puddle jumping, swimming ducks, and wiggling worms! 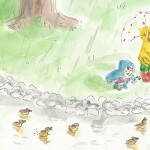 A thunderstorm sends the children scrambling for home and a cup of hot cocoa. Maybe it will rain again tomorrow! 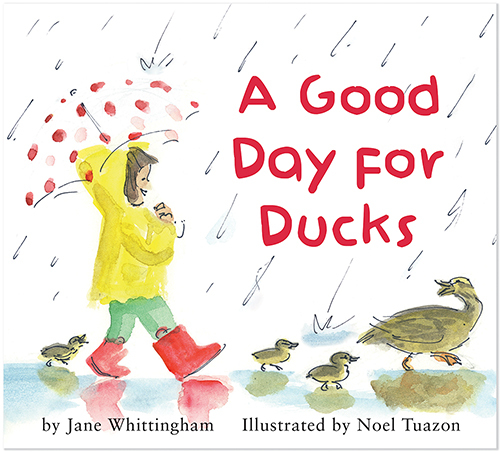 From the acclaimed creators of Wild One, A Good Day for Ducks is a child-centered celebration of the joy that can be found in any rainy day. Jane Whittingham‘s spare but sensory-laden text and Noel Tuazon‘s energetic and endearing illustrations are packaged in a sturdy book format with padded cover, rounded corners, and extra-heavy paper. 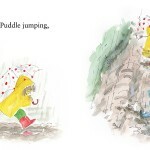 The format is perfect for eager, little hands, while the sweet story will make even the weariest of parents nostalgic for their own puddle-jumping days.